So here we are in the economic basket case they call Ireland, the old horrible year well and truly over and a new annuls horribly just beginning. The reality is that the year that stretches ahead of us is going to be even more grim than the one behind us. As the brief Christmas cheer recedes and the feel-good factor of the holiday evaporates, we are left to contemplate the sorry mess we are in. Over the coming weeks the cutbacks that were announced in the budget in December will begin to bite. It's one thing reading in the paper about these cuts in spending and hikes in tax. It's another thing when it's actually underway and life becomes a weekly struggle to pay bills and keep families above water. That's what is happening here now. The realization has sunk in that the tough times have arrived, there is no escape and it's not something temporary. It's going to be the reality not just for months, but for years. Not surprisingly, therefore, the prevailing mood here now is one of despondency. People are despondent because they see no future in Ireland. Those who can are planning their escape, mainly the young unemployed and the college leavers. Those who can't, those with families or those trapped by negative equity, are grimly carrying on, knowing that so much of their tax in the years ahead will be going not to support services but to pay the interest on the huge debt burden we carry. An indication of the national mood can be gauged from the fact that last weekend, The Irish Times began a major series called “How to Move Abroad.” Part one was about life in the U.S.
A major prime time documentary program on RTE television this Monday night was called Departure Day, telling the story of some of the new wave of emigrants as they prepared to go. There were young singles, of course, but there was also a young couple with two small kids who are setting out to build a new life in Canada. They said they didn't really want to go, but they wanted to be able to provide a standard of living for the kids which they can't do here now. They thought it unlikely that they would be back to live here for at least five years, maybe 10, maybe even longer. For people who can't get out, or don't want to get out, there is a high level of nervousness as well as despondency. People are nervous about their jobs, about further pay cuts, about holding on to their homes, particularly if they bought during the boom at an inflated price. This nervousness means that people have stopped spending, and instead they are saving for even rainier days. As a result the domestic economy is contracting, which is making a very bad situation even worse. Don't get mad, get even, the old advice goes. People know it won't alter the hard times we face, but even so they are getting ready to take their revenge on Fiona Fail, the party that has been in government for so long and bears responsibility for what has happened. The latest national opinion poll has them at 14%, a catastrophic fall in support for a party that has dominated Irish politics for decades. They only have themselves to blame, of course. They are guilty of gross economic mismanagement on such a scale that the EU and the International Monetary Fund have had to come in to take over our financial affairs. It's a national humiliation that is going to see Fianna Fail decimated in the election that is coming in a couple of months. If they only get 14% of the vote they will become a fringe party in Irish politics, with one former minister now predicting they could end up with as few as 12 seats in the Dail (Parliament). Usually a New Year brings some hope for the future. But the prospect here for this New Year -- and for the years that will follow -- is so poor that it's no wonder people are depressed about it. I mentioned above about families trying to keep their heads above water in the financial sense. But over the past few weeks, it was real water problems that were concerning so many people here as the cold weather meant that people all over Ireland, particularly in cities and towns, were without it for days on end. As if people were not miserable enough already, now they had no water. They turned on the taps and nothing came out. In some areas, they were without water for a week or two. And we are told the problem will persist for several more weeks, with low pressure and water being turned off at night. Where I live in north Dublin, the water is being turned off again tonight, even though the extreme cold spell ended over a week ago. It's like being in a Third World country and it seems to underline just how bad things here have got. What happened with the water was that the extremely cold weather all over Ireland at Christmas made pipes freeze and the ice inside burst them. It was the coldest December here in living memory. When the thaw came after Christmas and the temperature jumped 10 or 15 degrees in a single day, the ground in some places shifted and more pipes split. The result was that so much water was leaking away, taps simply ran dry. In other areas, including large parts of Dublin, supplies had to be cut off night after night to allow reservoirs to recover while repair crews desperately worked on the pipes. The authorities said it was a once in 50 year event, and tried to pass it off as an act of God that could not have been prevented. But the truth is more mundane, and it says a lot about the way money here was blown during the boom years instead of being spent on the right infrastructure. In the Dublin area there are around 800 miles of water mains, the big main pipes that carry the water from the reservoirs and distribute it around the city. 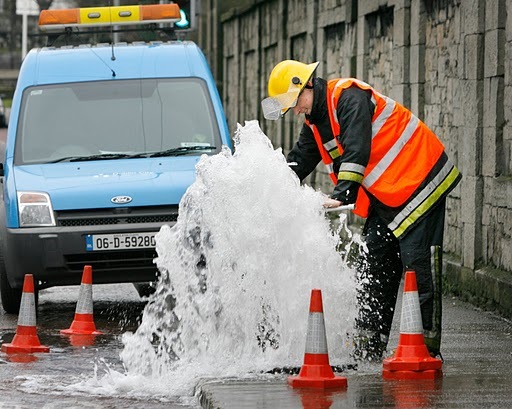 At least 80% of the 800 miles of water mains in Dublin is at least 100 years old; they are the old cast iron pipes that go back to Victorian times. The system was built by the British and given to us at independence and it served us well for years. But it has been deteriorating fast in recent decades and is now in urgent need of replacement. We've known this for years. The system is barely coping, it has been leaking heavily for a long time and the brittle old pipes are vulnerable to the kind of problems caused by the recent record cold spell. A few miles of water mains have been replaced in some years recently, but at the rate we're going it will take forever to modernize the system with new piping. In fact last year, no water mains were replaced at all. It's a perfect example of how work that desperately needs to be done somehow was overlooked during the boom years when we had money to burn. It's the same in other cities and towns here. Replacing water mains, of course, is a long term project with a long term pay-off which was not the style of the Celtic Tiger at all. Oh no. We wanted an instant bang for our buck. It's a good thing the empire building Brits were here to construct the magnificent Victorian system we have or we might not have water at all. Another aspect of the boom also made the recent water situation here worse. It's not only that we did not replace water mains. The problem is that a lot of the new housing estates built during the boom here had less than impressive water piping and plumbing. Builders in a hurry to rake in the profits ignored local laws on how deep supply pipes from mains into houses and apartments were supposed to be. They should have been deep enough to be well below the frost line, but in the recent cold snap pipes in new estates all around Dublin froze. All of which is very depressing. It's not just having to put up with water shortages. It's the knowledge that we're largely responsible for the mess ourselves. Even more depressing is the thought of what is to come. There's no money left to spend on upgrading the water system or on a lot of other essential things we should have been doing when the economy was booming. There's no money because for the foreseeable future a huge chunk of our diminished tax revenues will be eaten up paying back the EU and the IMF for loaning us the money to stop Ireland imploding. Apart from wreaking revenge on Fianna Fail, people here do not expect the upcoming election to achieve much. There is almost nothing that the opposition parties Fine Gael and Labor, who will be in government in a few months, can do to improve the situation. Their economic policies are miles apart, which will make progress difficult, and we are where we are, as the politicians like to say. We're up to our necks in debt and there's nothing we can do about it except tighten our belts and pay up. Well, almost nothing. There is something we could do that would transform the situation. But it's something that is likely to be far too radical for the next government. All will be revealed in this column next week.